Honey cells do have a bevel/angle up to 20°, while brood cells usually do have bevels below 10°. Because the upper part of the comb usually gets honey cells, your topbar bevel should be something towards 20°. If you bevel the topbar above 20° combs are more likely to break off the topbar. A flat topbar doesn't do much harm. But a bevelled topbar is taken more readily. Have you tested this design to see if they are more likely to build evenly on the bars with that angle, or were you more concerned with the quality/strength of the attachment? I'm wondering if they might as readily start building from the joins between the bars as from the lower edge, given its relatively low profile. I've been using them with 90 / 45 / 45 triangles. The comb on the edge of the triangle is incomplete i.e. the thickness of the comb is the same at the triangle as directly below, but this section is not used. I've not had a comb break off..... yet! This is another forum member's topbar with a bevel steeper than 20 degrees. See how they attach the comb, sort of balancing on he tip. That'll break off much easier. My bars are more like that picture. The bees I have start on the point like that but attach the comb up the angles making them secure and they do so rather quickly. I don't have a good picture showing the attachment well, but maybe I can get on the next time I open the hive. Of course they will attach it to the sides. The combs still come off more easily than on flatter bevel topbar. Just to make sure my post was clear, I'm not talking about them attaching to the sides of the hive. I've made a quick sketch, the "1" is what the picture you linked to seems to be showing. The "2" is how my bees have attached comb to the top bars with greater than 20 degree angles. I don't know if the angles in the sketch is accurate to my bars, it is only for demonstration purposes. I think this looks stable and has a greater surface of attachment than the lower angle would have. That was clear. Try to make a vertical cut right through such a comb. And fill in the cell walls into your sketch and you get what I am talking about! The comb is not solid but has cells. What do the cells look like at the top where it attaches to the topbar? A comb is not attached as a surface, it is not solid but has cell walls. By using too big cells, the cell structure weakens or at least differs from the cells below. Thus making a predetermined breaking seam. 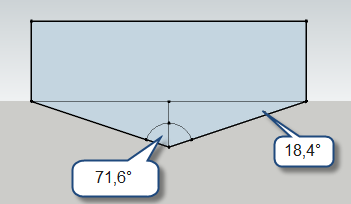 Right side is the topbar bevel below 20°, on the left side the more than 20° bevel topbar. I think you can actually see the difference! Thankyou - that might be really useful to me in the future. Currently all my top bars have grooves that I have melted wax into. What are your thoughts on priming the top few mm of the bar - perhaps I should say the bottom of the bar with wax? That is an interesting comparison. I don't know if the weather will allow me to get pictures this weekend or not, they are forecasting some much needed rain. I do want to post some pictures of my bars (greater than 20 degrees) to see what you think of them. To my eye (and memory), it looks like my bars have attachment more like the right bar in that picture. I was wrong in my sketch above. It was based on my memory of glancing at the tops of the bars and making assumptions. If you click on the image it will bring up a larger picture. The first picture is of the bar end on showing the cross section. There is a flat spot at the ridge, I forget what angle I set the saw at when I cut these and haven't measured / figured what these are. After looking closely, the bees don't follow the ridge all the way down. They have started on the ridge but as they build along the bar they drift to the side resulting in a mild s-shape or diagonal line across the ridge. As of today, they haven't crossed bars when building comb. I don't think the way this comb is built is particularly un-secure, but I can't say for sure. You may be right that a lower angle will prove better. I may have to try that on the next one. Following zaunreiter's research and tip, I have made such topbars (20 degrees). There is only one groove cut down the middle and filled with the molten wax. So far - there are no cross combs. I did have one young comb (few days old) almost fall down when I was rotating her, but did not fall. Probably because it was still very weak and full of bees. It was easy to construct (only thing a bit harder is to adjust my table saw to cut in 20 degrees - rest is just easy). Good thing about it all - no glue necessary to make such top bars. My topbars are similar to yours, cut at about 18 degrees and I am quit happy with this. I melted starter stripes into the groove, extending about 1,5cm under the bars, but have found the attachment to be better ( broader and more regular) in the area without the starter stripes. I've figured out that they only need the wax so to know where to start making it (recognize it by smell).